PA reveals that the rock is the 'best friend ever' of Palestinians, in fresh wave of incitement to terror despite US threats of aid cut. Even as it scoffs at US threats to cut over $5 billion in funding over its incitement to terror, the Palestinian Authority (PA) has launched a fresh wave of incitement to attacks against Jews. 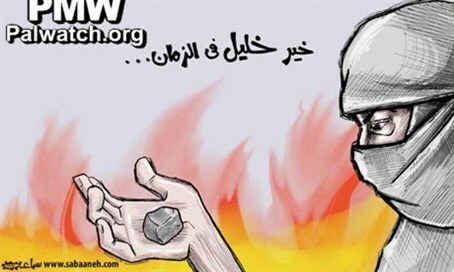 In a new cartoon in the official PA daily Al-Hayat Al-Jadida from Wednesday, Arab readers are taught that the rock is the "best friend ever" of Palestinian Arabs, in a clear call for more lethal attacks exposed by Palestinian Media Watch (PMW). PA Chairman Mahmoud Abbas's Fatah faction continued its leading role inciting the rock attacks, with a post Monday on its official Facebook page showing a masked rioter hurling a rock in a slingshot with the text: "the intifada continues; #the_rage_of_Jerusalem." Fatah branched out with its social media terror incitement, also posting a cartoon on its Twitter page on Saturday paying homage to a local cartoonist who recently passed away. In the cartoon an Arab couple is shown, with the man holding a rock in one hand and the Palestine Liberation Organization (PLO) flag in the other, while the woman has two fingers raised in a V for "victory." "We will continue, artist Baha Al-Bukhari, Allah have mercy on him; #Palestine; For the soul of Baha Al-Bukhari, we will continue," reads the accompanying text. The cartoonist, Baha Al-Bukhari, who worked for Al-Ayyam newspaper, died on October 29. Several of his cartoons directly incited terror attacks against Israelis, and likewise reinforced anti-Semitic stereotypes against Jews. In October he was awarded the Palestine Order of Merit for Culture, Sciences and Arts by Abbas, who said his work "fits Palestine and its resolute and full culture."